All our Resin Bound Drives, Paths and Patios are made up of 100% natural stone which looks fantastic, yet is as strong and durable without the heavy cost to the planet. Why Choose A Resin Coating? That’s simple, our product naturally drains water through the finished surface which means no more puddles. It is also resistant to weeds, hence giving it all round better traction for tyres and making it better for walking on. Last but not least its up to 10 times more eco friendly than concrete. 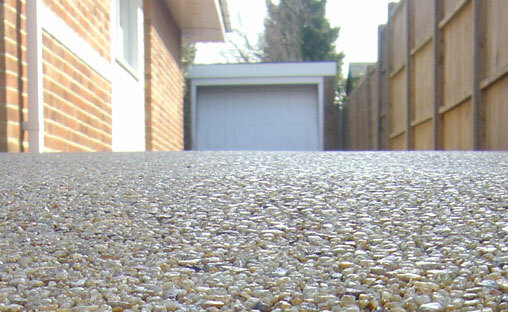 We can lay our Permeable Resin Bound System straight onto your existing concrete or tarmac drive. We won't need to excavate. This means you get your new real stone gravel drive laid fast, simply and cleanly. We can complete most jobs within 1 or 2 days. The Resin application only takes a few hours to dry, so there will be minimum disruption to your daily routine. As Resin Bound System installers, our experience stretches across a wide range of designs. You may not have seen the Drive, Pathway or Patio you are looking for because our range is made to order, we can easily fulfil your requirements and make your dream a reality. Thank you for our Driveway. Outstanding job. Glad we saw you at the New Forest Show. I do not know how we managed so long with the old drive!. The Environment Agency strongly encourage the Resin Bound system to help tackle the growing threat of flooding in many areas. This is why it's especially ideal for parks, play areas, large drives, paths and playgrounds.